With their bright graphics and contemporary lines, the Milkdot Stöh lunch tote could easily be mistaken for a hip handbag or compact shopper tote. 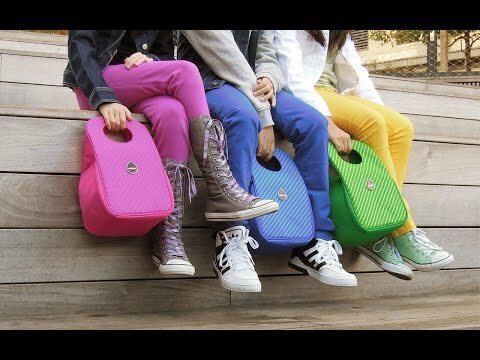 But this modern lunch box has revolutionized the packed lunch ritual, combining insulation and collapsibility with striking design and environmentally friendly materials. The idea for Milkdot began when designer mom Janet Cho was alarmed by the toxic materials she found in other lunch boxes. She founded Milkdot to focus on creating high quality, environmentally safe products that look as great as they work. It’s simple to stack containers inside, and Stöh’s design keeps the contents upright. Carry Stöh with comfortable handles that are magnetized for easy closure, while the tote’s insulation keeps foods hot or cold. And even with its roomy interior, when lunch is over Stöh folds flat for easy storage. Rigorously tested and approved by the Consumer Product Safety Commission, the totes’ fabric is not only free of PVC, phthalates and lead; it’s also water repellent and easily spot-cleaned. Anyone can feel good about toting their lunch in this fresh, fun lunchbox with style that appeals to parents and kids alike. Hi everyone! I'm Janet, the founder and designer of Milkdot. I designed the Stöh lunch tote when I couldn't find a lunch bag that was modern, functional and non-toxic for both kids and adults. So excited to be here on The Grommet and happy to answer any questions you may have! this looks great! besides a lunch pack, is it large enough to hold a "six-pack" of any canned beverage? would be great on my boat! @christopher Thanks, Christopher! As long as the cans are standard size, 6 of them should be able to fit on their sides with a slim ice pack. @christopher Thanks!! We've also taken this to the beach on a day over 85 degrees with no umbrella and our canned sodas stayed cold with just a small ice pack. Will these hold a large styrofoam cup that has a lid on it upright without spilling? @Frances Hi Frances! We recommend that liquids are packed in a spill proof container like a reusable bottle. I usually pack my son's lunch in an Easy Lunch box or similar sized box (dimensions 9.38 x 6.1 x 2). Tell me about the dimensions listed for the bag - 7.5 x 6 x 12.5 - Is the 7.5x6 the length and width and the 12.5 the height? I'd love a bag that holds my son's lunch upright, but i'm not sure this is the bag that will do it. @Katie Hi Katie! The inside compartment height can stretch up to 9 inches but because the top is curved, a container that is rectangular with 90 degree corners with a height of more than 7 inches will not fit. @Katie I forgot to mention that the width is 7.5" and the depth is 6". 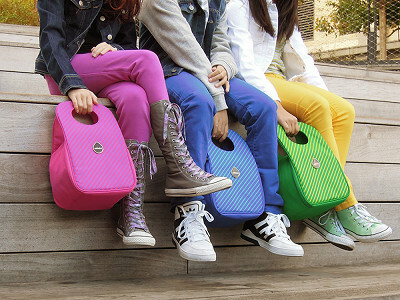 The inner bag height is 8 inches but can stretch to 9 inches. So for example, a bottle that is 9 inches tall can fit inside if packed in the center. Hope that helps! @Janet Bummer. My 9.38 X 6.1X 2 boxes would not sit in it flat. That's too bad. I thought it was a great idea. Hi Janet, One of my main concerns with my children's lunches is does it stay cold enough throughout the day. If they don't eat something, will it be kept cold enough to eat at a later time. I guess my question is, how well insulated is it? Hi Nicole, thanks for the question. With an ice pack, the tote will keep food and drinks cold for six hours. Of course, that does depend on the outside and room temperatures. @Nicole Hi Nicole! Mike is correct. Depending on the outside and room temperature where the bag will be exposed, with an ice pack, the inside can stay cold for up to 6 hours if the bag stays closed. It also depends how good the ice pack is too. We've received feedback from customers that our lunch tote insulates well. Hi! A question--will a glass quart jar fit standing up in this lunch tote? Thanks! Hi Deborah, if the height of the jar is 9 inches or fewer then yes. As Janet mentioned above, there is some flexibility with the height of the tote for bottles, jars, etc. if they are placed in the middle. @Deborah. Hi Deborah! To expand on Mike's comment and give you an example, we have a bottle that can hold 34 fluid ounces which is slightly more than a quart and it fits in our lunch tote standing up. @Janet Will you be offering them in a larger size in the future? Hi Janis, currently there is no larger size available. But if we do offer one at some point, we will provide an update on the site. @Janis Hi Janis! We originally started off with a smaller size lunch tote and this current size has become our larger size which we find works well for both kids and adults. If we do introduce a different style in another size, the Grommet Team can let you know. With their bright graphics and contemporary lines, the Milkdot Stöh lunch tote could easily be mistaken for a hip handbag or compact shopper tote. But this modern lunch box has revolutionized the packed lunch ritual, combining insulation and collapsibility with striking design and environmentally friendly materials. The idea for Milkdot began when designer mom Janet Cho was alarmed by the toxic materials she found in other lunch boxes. She founded Milkdot to focus on creating high quality, environmentally safe products that look as great as they work. It’s simple to stack containers inside, and Stöh’s design keeps the contents upright. Carry Stöh with comfortable handles that are magnetized for easy closure, while the tote’s insulation keeps foods hot or cold. And even with its roomy interior, when lunch is over Stöh folds flat for easy storage.